A key to good design principles is spacial quality. Parts of the landscape need to function like separate rooms, connected with a unified design theme. Equally important, is the notion of movement. How does the landscape accommodate motion? A property needs to convey a sense of arrival and along with it, the delight of discovery. A dramatic hidden feature awaiting to be explored. The entry to the garden is always a narrative waiting to unfold to the delight of the invitee guest. The drama and beauty of the spaces created connected with maximum visual impact and functionality are what the design professionals at IVY Studio attempt to create with every design we undertake. 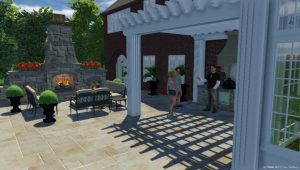 We are a landscape design and build consulting firm based in the metro Boston area specializing in residential landscape design and project implementation and project management. Contact us at 781-591-0300 or vern@ivystudioMA.com to schedule a no obligation consultation and review of your landscape and upcoming projects to expand your outdoor environment.